Immature teratoma (IT) represents 3% of all teratomas, 1% of all ovarian cancers and 20% of malignant ovarian germ cell tumors. It is found either in pure form or as a component of a mixed germ cell tumor. It occurs essentially during the first two decades of life. According to WHO, immature teratoma (IT) is defined as a teratoma containing a variable amount of immature embryonal type (generally) neuroectodermal tissue. This study aims to look at the morphological spectrum of immature teratoma and to study the correlation of grade and stage of the tumor with prognosis. This is a retrospective study. The case files from the year 2002 to 2008, showing a final diagnosis of immature teratoma for the patients, were looked up for from the Department of Pathology in our hospital, and a total of 28 such cases were retrieved. The cases with the diagnosis of mixed germ cell tumors were not included. During the same duration, a total of 242 ovarian germ cell tumors were seen, (thus IT of ovary comprised of 11.6% of all ovarian germ cell tumors at our institution from 2002 to 2008). 19 out of 28 cases being referred, the blocks and slides were sent from other institutes (material ranging from 2 to 25 blocks, mean 10 blocks). In the remaining cases, specimens were available. The gross findings were available in 10 cases. The tumor size ranged from 5 to 28 cm. Most of the cases showed solid and cystic foci, with mucoid, creamish and cartilaginous areas. The hematoxylin and eosin stained slides of all the cases were reviewed by two pathologists (KD and BR). Presence or absence of neuroepithelium was recorded. The ovarian immature teratomas were graded as per the accepted three tier grading system by Norris et al. Presence of immature mesenchyme was looked up for; and, grading was done by a method similar to the grading of the neuroepithelium. Relevant clinical, demographic and radiological information was extracted from the files and record forms of the patient. Staging of the tumors was done according to the International Federation of Gynaecologists and Obstetricians (FIGO) staging system for primary ovarian carcinomas, wherever possible. Follow up time was calculated from the day of surgery to the last day of contact with each patient. Our study included a total of 28 cases. As our centre is the tertiary referral centre, majority of our cases were operated elsewhere and were then referred for further advice and treatment. The age at presentation ranged from 4 years to 40 years with median age of 19 years. Seventeen patients were unmarried and 11 patients were married. None of our patients was pregnant at the time of presentation. Fifteen patients presented with abdominal pain, 13 patients presented with abdominal mass and in one case, the patient presented with secondary amenorrhea. Immature teratoma was unilateral in all these cases (right - 10, left - 15 and site not mentioned - 3). However in 2 cases contralateral ovary showed concurrent dermoid cyst. Preoperative tumor marker levels were available in 15 cases. Alfa feto protein (AFP) was raised in 10 cases (range 24-9283 ng/ml; in 4 cases less than 100 ng/ml) while cancer antigen 125 (CA125) was raised in 5 cases (ranging 33-112 units/ml). 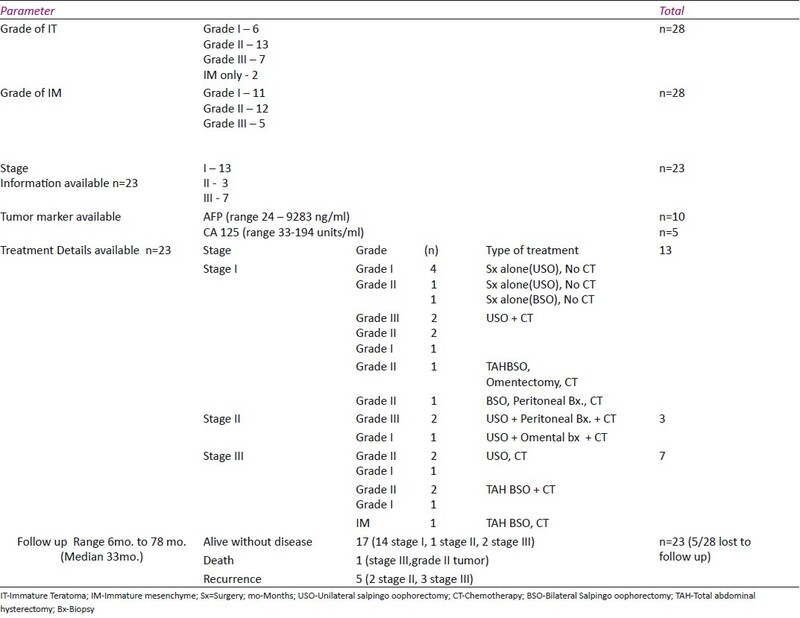 The tumor stage was available in 23 cases and the details are given in [Table 1]. There were varied histomorphological features. A variety of mature elements were present [Figure 1] and [Figure 2]. Immature teratoma was 'pure' in 25 cases (absence of other malignant germ cell tumor component). In 3 cases, other germ cell tumor components were found (yolk sac tumor in 2 cases and dysgerminoma in 1 case). 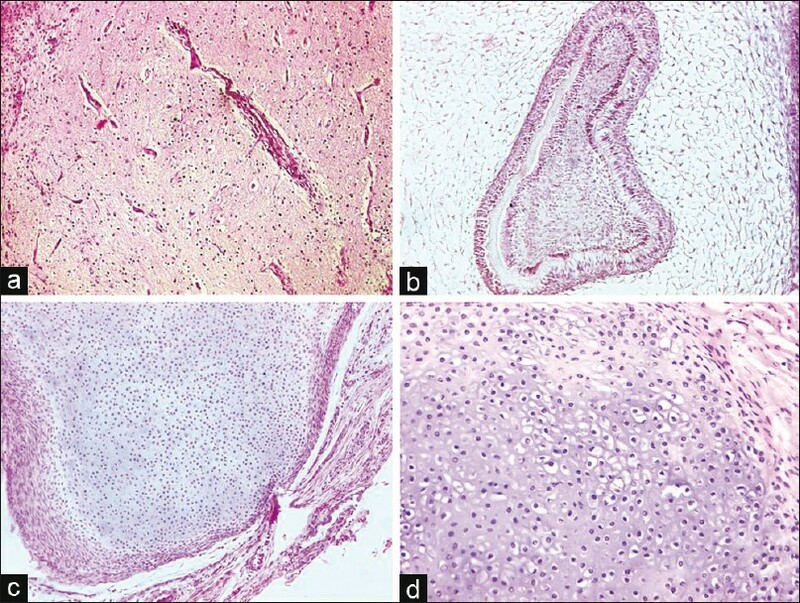 Twenty six immature teratomas were graded based upon the presence of immature neuroepithelium, [Figure 3] and [Figure 4] as per the standard defining criteria. Six were grade I, 13 were grade II and 7 were grade III immature teratomas. It was observed that grade I teratomas were associated with more mature elements like mature glial tissue and mature cartilage in contrast to grade III teratomas. 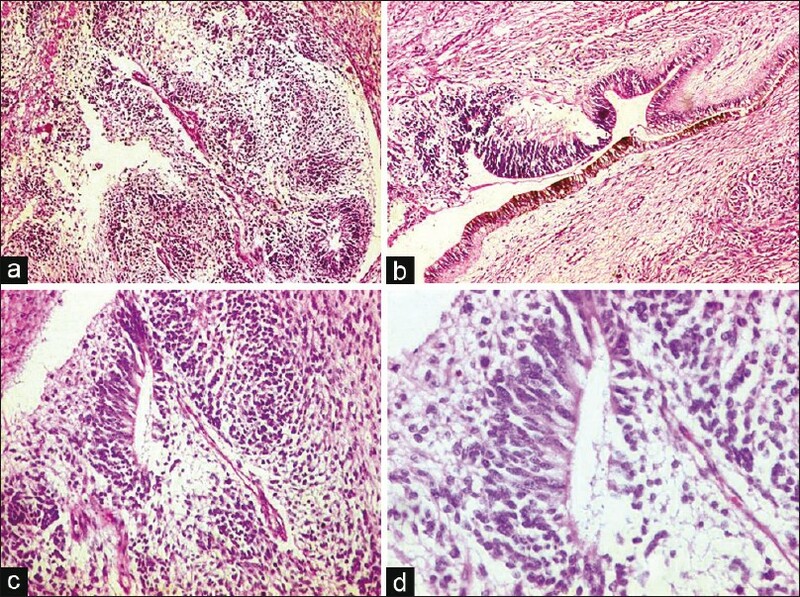 In 2 cases immature neuroepithelium was not detected and these were considered as immature teratoma due to presence of abundant immature mesenchyme. In all 28 cases, we found immature mesenchyme defined as sparsely cellular, loose, primitive mesenchymal tissue [Figure 5] with mitotic figures. We applied similar criteria (as applied to grade the neuroepithelium) to grade the immature mesenchyme. The findings are given in [Table 1]. It showed grade I immature mesenchyme in 11 cases, grade II in 12 cases and grade III in 5 cases. We did not find any significant correlation between immature mesenchyme grade and the grade of immature teratoma. Peritoneal implants of mature glial tissue (gliomatosis peritonei) were present in 3 cases. Treatment details and follow up information was available in 23 cases. Of these, 13 were stage I, three were stage II and 7 were stage III ITs. Out of 13 in stage I immature teratomas, 4 grade I and only one grade II immature teratoma were treated by surgery alone consisting of unilateral salpingo-opherectomy (SO) without any chemotherapy. One case with dermoid cyst of contralateral ovary underwent bilateral salpingo-oophorectomy (without chemotherapy). Two grade III, 2 grade II and One grade I IT underwent SO with additional chemotherapy with bleomycin, etoposide and cisplatinum (BEP). One case with stage I, grade II IT of ovary underwent Total abdominal hysterectomy with salpingo-oophorectomy (TAHBSO), omentectomy and BEP chemotherapy; while one case of stage I, grade II IT underwent bilateral salpingo-oophorectomy (BSO), peritoneal biopsy and BEP chemotherapy. There were 3 cases of stage II ITs, two being grade III tumors and one of grade I tumor. Out of these 3 stage II ITs, 2 cases of grade III and one patient of grade I IT underwent unilateral SO and BEP chemotherapy. There were total 7 stage III ITs. Out of which 3 cases (grade II - 2, grade III - 1) underwent unilateral SO and BEP chemotherapy, 3 cases (grade II - 2, grade III - 1) underwent total abdominal hysterectomy with bilateral salpingo-opherectomy and BEP chemotherapy. In one case neuroepithelium was absent and it was treated by total abdominal hysterectomy with bilateral SO and BEP chemotherapy. Follow up was ranging from 6 months to 78 months with median follow up of 33 months. Out of 23 patients, 17 patients were alive without evidence of disease at the last follow up. Adverse events in the form of death and local recurrence occurred in 6 patients. One patient died of the disease at 7 months (stage III, grade II IT). In this patient, there was a predominant component of yolk sac tumor along with immature teratoma and which was treated by total abdominal hysterectomy with BSO and BEP chemotherapy. Despite the chemotherapy, local recurrence in the form of pelvic mass occurred after 4 months and patient died after 3 months due to refractory disease. Five patients had local recurrences in the form of pelvic mass at the interval of 3 months, 12 months, 4 months, 4 months and 7 months, respectively. All these patients additionally received BEP chemotherapy and are kept on further follow up with radiology and tumor marker levels. They are doing well after 78, 16, 62, 6 and 78 months respectively. In this study, a variety of differentiated tissues were present in the tumors, e.g., skin and skin adnexal tissue, glandular tissue, mature glia, choroid plexus, tooth anlage, cartilage etc. We observed that differentiated ameloblastic epithelium closely resembles neuroepithelium and this can be a potential pitfall for an erroneous diagnosis of immature teratoma [Figure 6]. In 2 cases, immature neuroepithelium was absent and these were considered as immature teratoma due to presence of abundant immature mesenchyme. However according to a review article by Ulbright,  fetal type tissue (immature mesenchyme) alone is not sufficient for a diagnosis of IT. Immature mesenchyme is defined as sparsely cellular, loose, primitive mesenchymal tissue with mitotic figures. The literature is sparse in discussing whether a significantly more cellular cartilage can be taken as immature mesenchyme. Cartilage with crowding of lacunae with cells (cellular cartilage) which is surrounded by immature mesenchyme is taken as immature cartilage. We, however, accept that there can be subjectivity in this assessment. Morphological spectrum of immature teratoma of the ovary is varied, complex and offers diagnostic challenges. 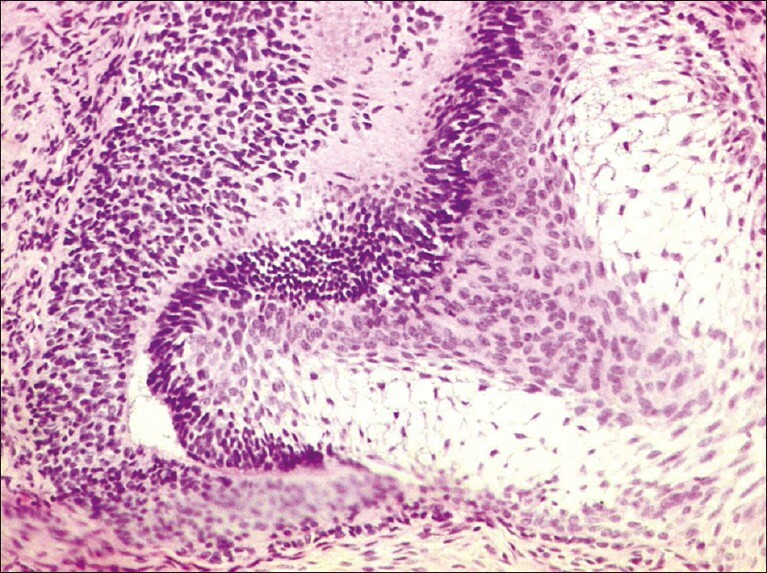 The literature suggests that presence of immature neuroepithelium is essential to make a diagnosis of immature teratoma (mere presence of immature mesenchyme is not sufficient). However, presence of immature mesenchyme should prompt a careful search for immature neuroepithelium. There is considerable variation about the interpretation of what constitutes immature neuroepithelium. In grading of IT, primitive neural tubes and immature rosettes are counted. Such tissue simulates various patterns of stroma: poor undifferentiated neuroblastoma, primitive neuroectodermal tumour or peripheral neuroepithelioma. Literature suggests grade I IT have much better prognosis. Combination of surgery and chemotherapy can give longer survival even in recurrent disease. In this study, based on the follow up information, stage I tumors showed favourable outcome. We are unable to make a definitive comment about only the grade and survival due to less sample size and possibility of non uniformity in the treatment. 1. Nogales F, Talerman A, Kubik-Huch RA, Tavassoli FA, Devouassoux-Shisheboran M. Germ Cell Tumours. In: Tavassoli FA, Devilee P, editors. World Health Organisation. Classification of Tumours. Pathology and Genetics Tumours of the Breast and Female Genital Organs. Lyon: IARC press; 2003 p. 163-75. 2. Norris HJ, Zirkin HJ, Benson WL. Immature (malignant) teratoma of the ovary: A clinical and pathologic study of 58 cases. Cancer 1976;37:2359-72. 3. Wisniewski M, Deppisch LM. Solid teratomas of the ovary. Cancer 1973;32:440-6. 4. Nogales FF Jr, Favara BE, Major FJ, Silverberg SG. Immature teratoma of the ovary with a neural component ("solid" teratoma). A clinicopathologic study of 20 cases. Hum Pathol 1976;7:625-42. 5. van Altena AM, Wijnberg GJ, Kolwijck E, de Hullu JA, Massuger LF. A patient with bilateral immature ovarian teratoma presenting with paraneoplastic encephalitis. Gynecol Oncol 2008;108:445-8. 6. Heifetz SA, Cushing B, Giller R, Shuster JJ, Stolar CJ, Vinocur CD, et al. Immature teratomas in children: Pathologic considerations - A report from the combined pediatric oncology group/children's cancer group. Am J Surg Pathol 1998;22:1115-24. 7. Kawai M, Kano T, Furuhashi Y, Iwata M, Nakashima N, Imai N, et al. Immature teratoma of the ovary. Gynecol Oncol 1991;40:133-7. 8. Ikarashi T. Immature teratoma of the ovary. Correlation between serum alpha-fetoprotein value and immunohistochemical analysis. Asia Oceania J Obstet Gynaecol 1984;10:523-30. 9. Esterhay RJ Jr, Shapiro HM, Sutherland JC, McIntire KR, Wiernik PH. Serum alpha fetoprotein concentration and tumor growth dissociation in a patient with ovarian teratocarcinoma. Cancer 1973;31:835-9. 10. Lawson CS, Mansi JL, Wiltshaw E. Prolonged survival in a patient with disseminated malignant teratoma in the presence of a persistently elevated serum alpha-fetoprotein level. Cancer 1989;63:804-6. 11. Gonzalez-Crussi F, Winkler RF, Mirkin DL. Sacrococcygeal teratomas in infants and children: Relationship of histology and prognosis in 40 cases. Arch Pathol Lab Med 1978;102:420-5. 12. O'Connor DM, Norris HJ. The influence of grade on the outcome of stage I ovarian immature (malignant) teratomas and the reproducibility of grading. Int J Gynecol Pathol 1994;13:283-9. 13. Ulbright TM. Germ cell tumors of the gonads: A selective review emphasizing problems in differential diagnosis, newly appreciated, and controversial issues. Mod Pathol 2005;18 Suppl 2:S61-79. 14. Calder CJ, Light AM, Rollason TP. Immature ovarian teratoma with mature peritoneal metastatic deposits showing glial, epithelial, and endometrioid differentiation: A case report and review of the literature. Int J Gynecol Pathol 1994;13:279-82. 15. El Shafie M, Furay RW, Chablani LV. Ovarian teratoma with peritoneal and lymph node metastases of mature glial tissue: A benign condition. J Surg Oncol 1984;27:18-22. 16. Harms D, Jänig U, Göbel U. Gliomatosis peritonei in childhood and adolescence. Clinicopathological study of 13 cases including immunohistochemical findings. Pathol Res Pract 1989;184:422-30. 17. Truong LD, Jurco S 3 rd , McGavran MH. 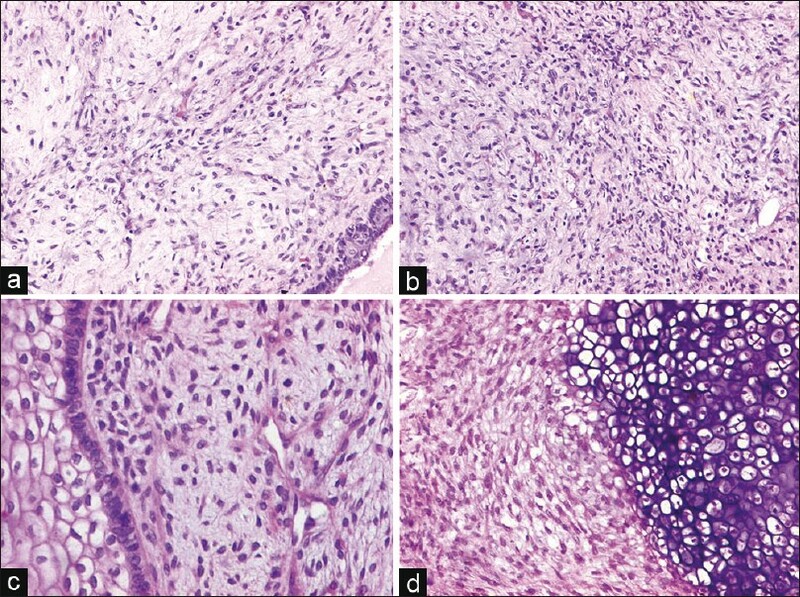 Gliomatosis peritonei. Report of two cases and review of literature. Am J Surg Pathol 1982;6:443- 9. 18. Robboy SJ, Scully RE. Ovarian teratoma with glial implants on the peritoneum. An analysis of 12 cases. Hum Pathol 1970;1:643-53. 19. Nielsen SN, Scheithauer BW, Gaffey TA. 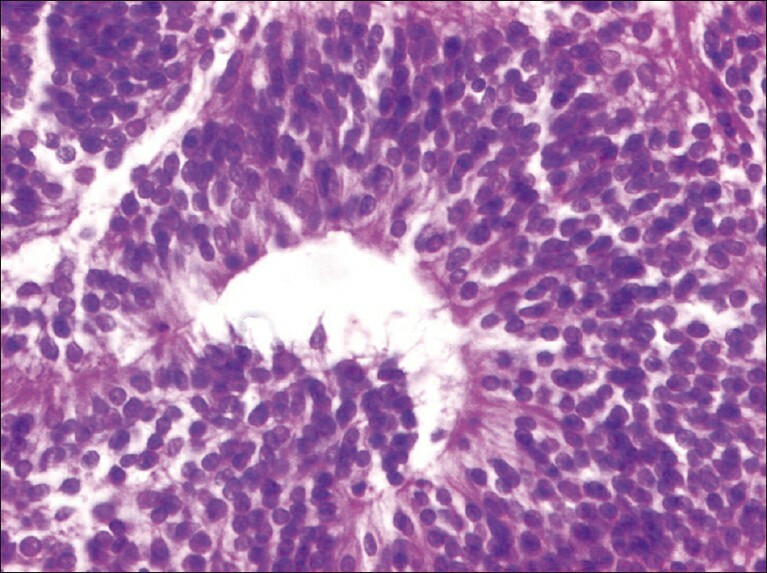 Gliomatosis peritonei. Cancer 1985;56:2499-503. 20. Gershenson DM, del JG, Silva EG, Copeland LJ, Wharton JT, Rutledge FN. Immature teratoma of the ovary. Obstet Gynecol 1986;68:624-9. 21. Gershenson DM. Management of ovarian germ cell tumors. J Clin Oncol 2007;25:2938-43. 22. Pectasides D, Pectasides E, Kassanos D. Anti tumour treatment. Germ cell tumors of the ovary. Cancer Treat Rev 2008;34:427-41.